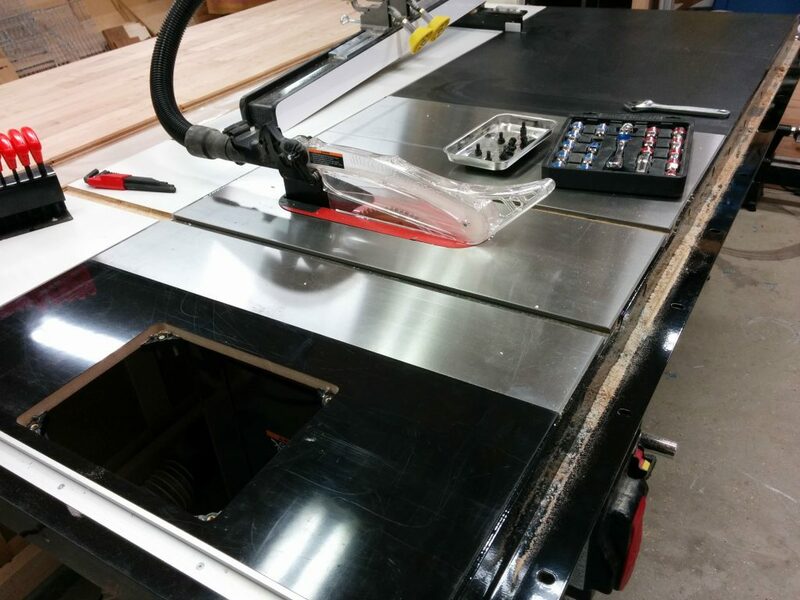 Home›Tutorials›Table Saw Enhancement – Attaching Sliding Crosscut Table Without Cutting Down the Rails. My table saw is fairly decked out and I’ve made some modifications to it in the past but some of them weren’t working that well for me. 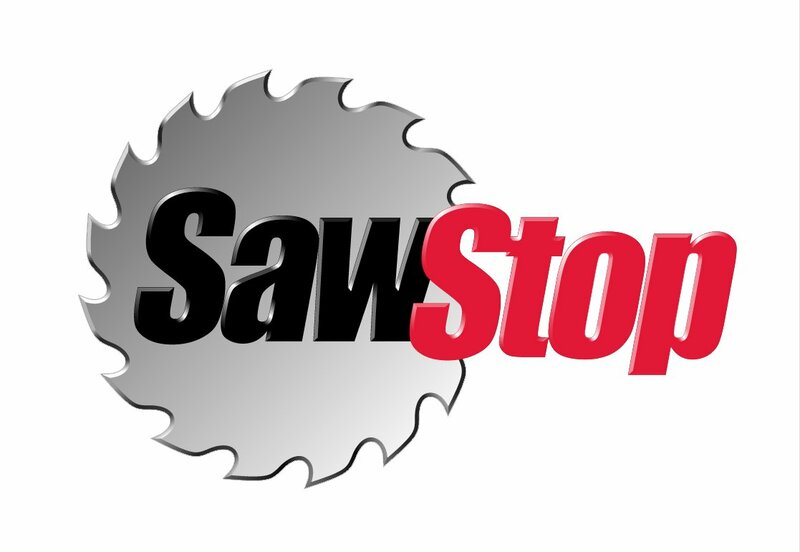 My saw is a SawStop Industrial Cabinet Saw 3 HP single-phase, 230 VAC machine (ICS31230) with a 52″ fence system and the sliding crosscut table. 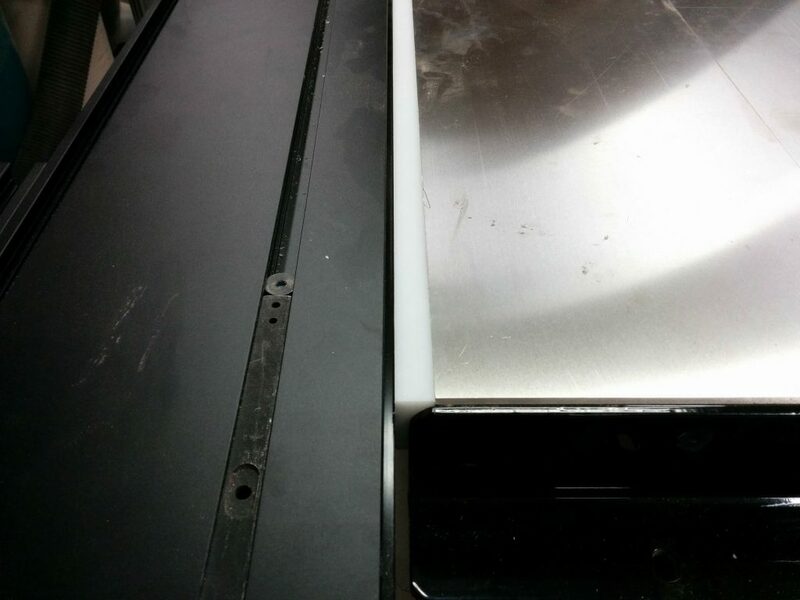 As an experiment, I had previously taken the left cast-iron wing off and replaced it with a custom router table. The reason behind having the router table in that spot is because I didn’t have any room on the far-right edge of the saw the way my shop was set up previously. I needed to have it on the left but I wasn’t sure if it would work with the sliding crosscut table or if that would be in the way. 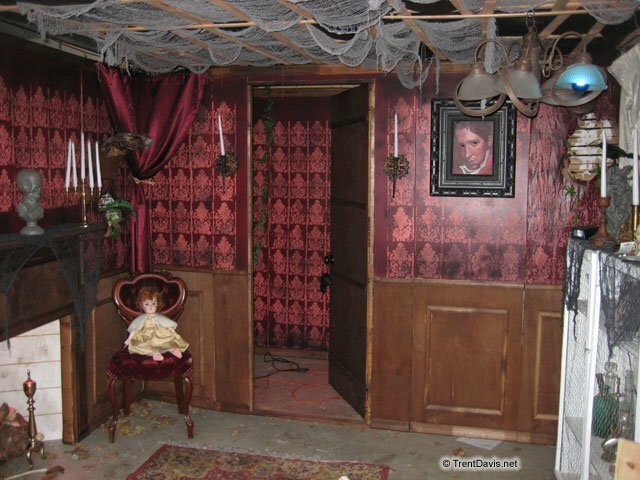 As it turns out, it wasn’t too awkward having the router table there. It did, however, affect the accuracy of the sliding crosscut table since it wasn’t supported by anything but a wooden table. 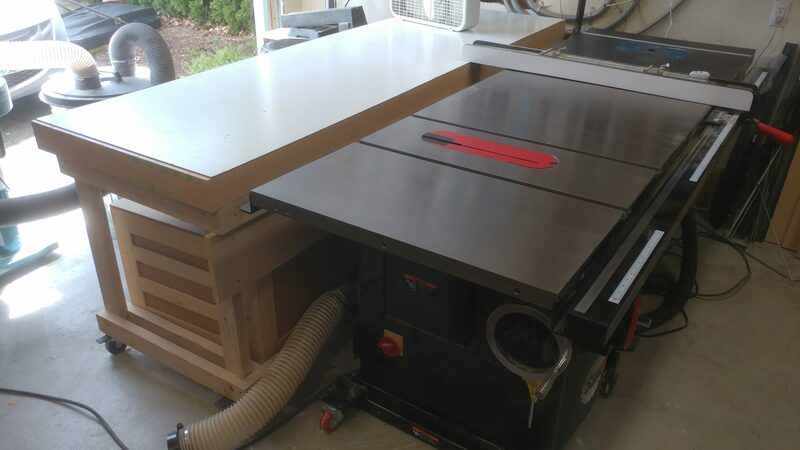 After I rearranged my shop I decided to move the router table to the far right edge of the table saw and reattach the sliding crosscut table to the left cast-iron wing as originally intended. In order to accommodate the router table miter slot without having to cut notches in the front and rear rails, I decided to add another cast-iron wing to my saw thereby pushing the extension table out another ten inches. I also decided to use this opportunity to document how I attach the sliding crosscut table to the left cast-iron wing without having to cut my rails down. Since this is a fairly long post, I decided to break it up into individual posts. The links to the other modifications are at the end if this article. 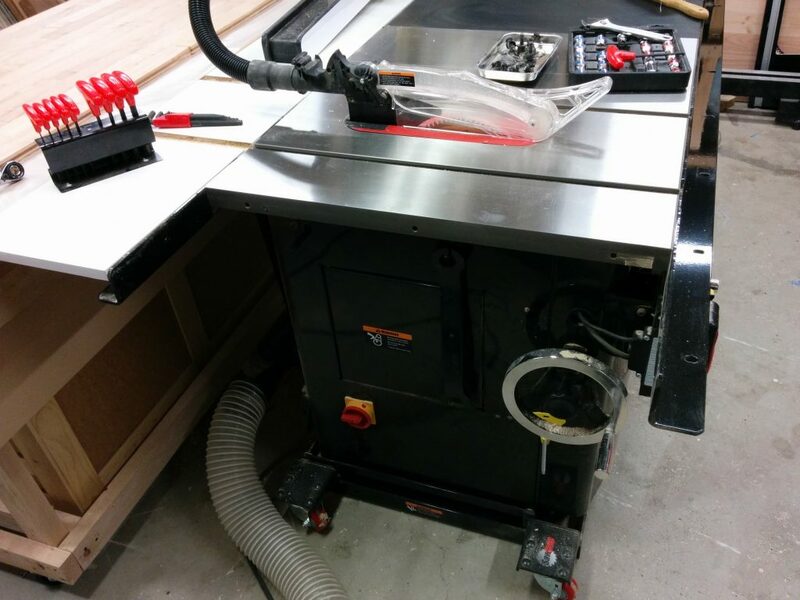 Removing the router table and installing the Sliding Crosscut Table. This is how my sliding crosscut table was attached previously. Notice that the cast-iron wing on the left of the main saw table has been removed and replaced with a wooden router table. Time to undo this mess. 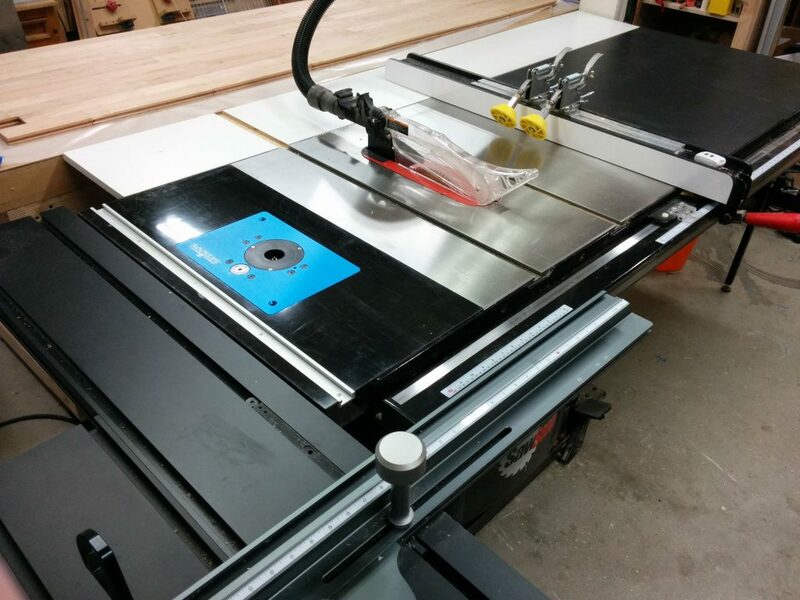 The sliding crosscut table mounted to a router table on the left of the saw. 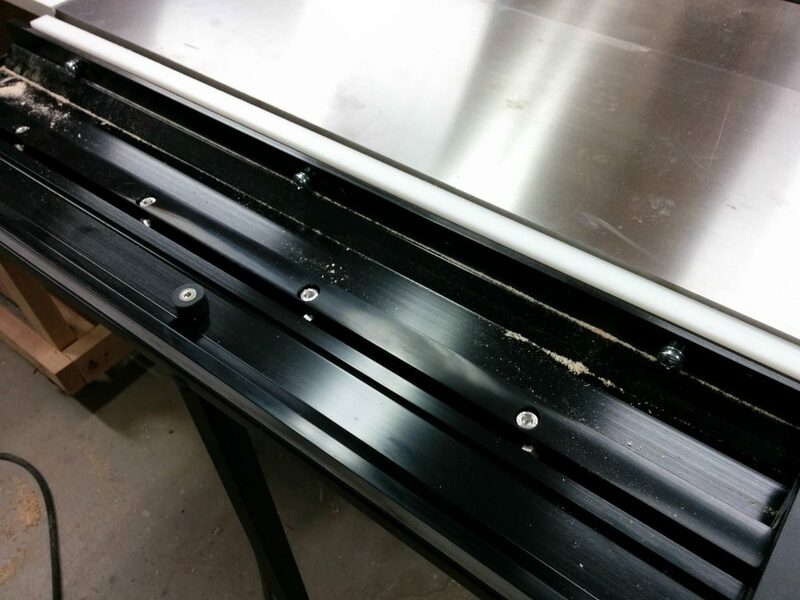 I started by removing the router lift from my existing router table as well as the sliding crosscut table. I also removed the front tube that the fence clamps to. Removed the slider and the front tube. Then I removed the old router table. I’m using this as my routing template on my new table so I’m not getting rid of it just yet. Removed the old router table. I reattached the cast iron wing. 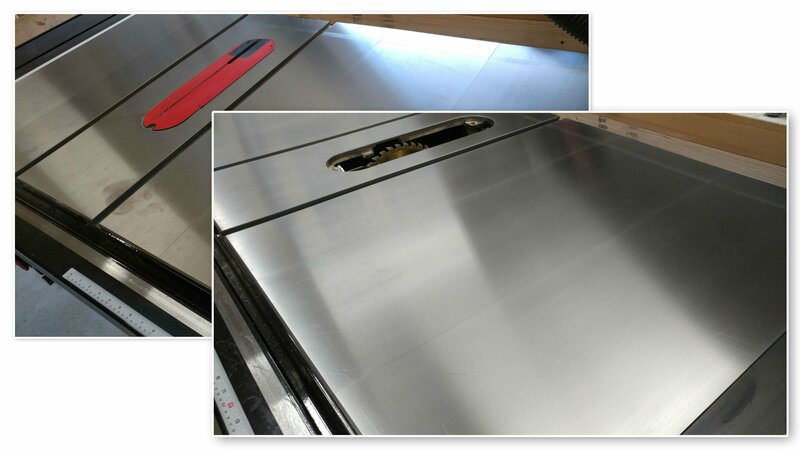 The problem with adding a sliding crosscut table to a table saw is that you will typically have to cut your rails and tube down since they will usually stick out past the cast iron. 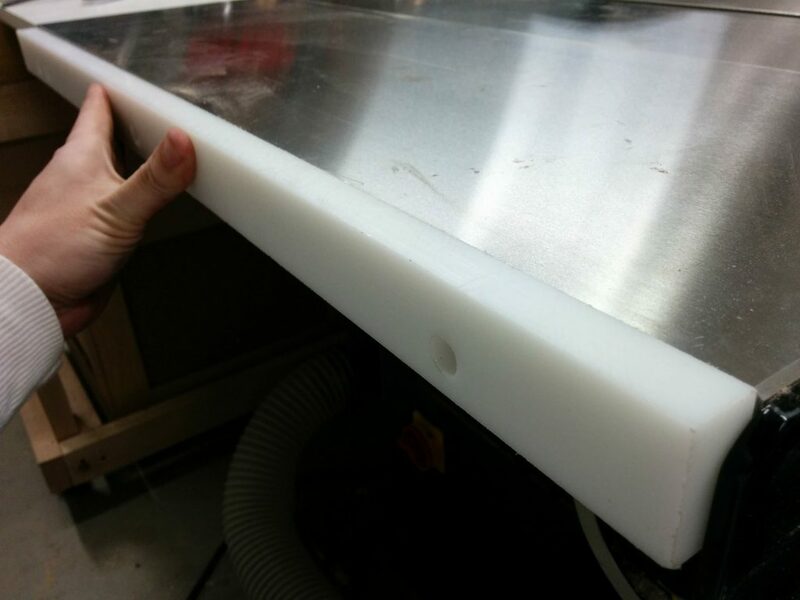 I got some 3/4″ thick HDPE and cut it to the dimensions for the side of my saw, which is 1-1/2″ thick and 30″ deep. 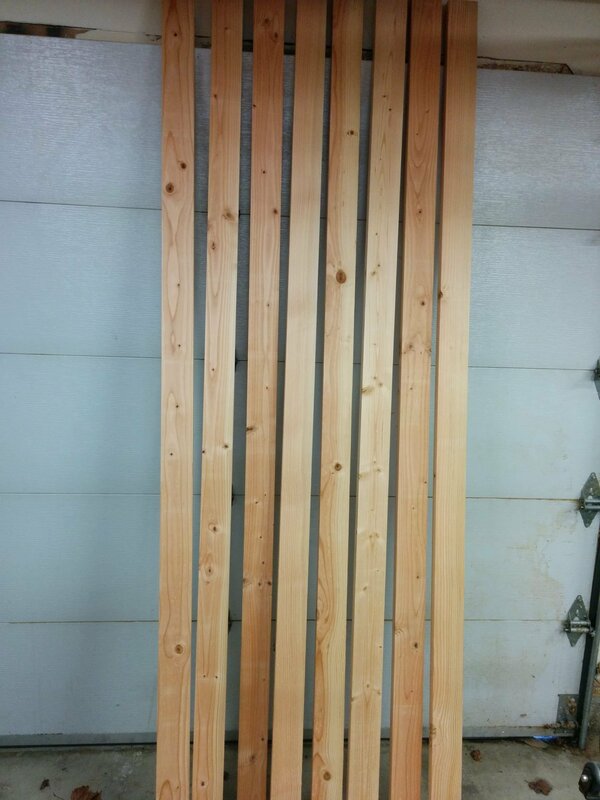 After cutting this down I drilled holes to match the side of the table. HDPE spacer for attaching the sliding crosscut table to the left wing. Once it’s drilled, you can hold it in place on the side of the cast iron wing and attach the sliding crosscut table to it. 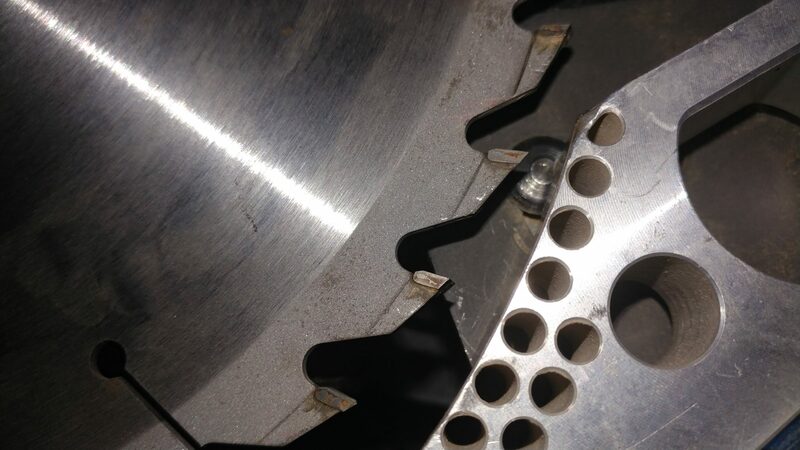 Holding the spacer in place. You’ll most likely need to get longer bolts for this. 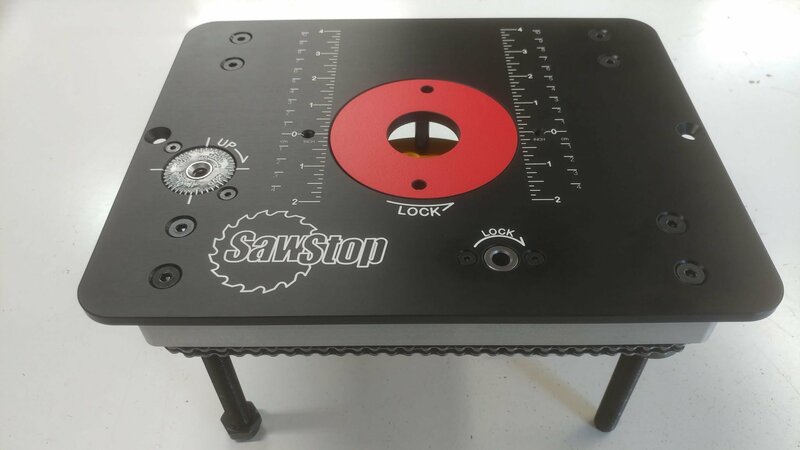 With the SawStop sliding crosscut table, the bolt type and size isn’t too critical. You just need to make sure they don’t interfere with the sliding mechanism. Loosely fitting the sliding crosscut table and the HDPE spacer to the left cast-iron wing. Get it all tightened up and flush and you are good to go. I recommend using a pretty dense material for this spacer. 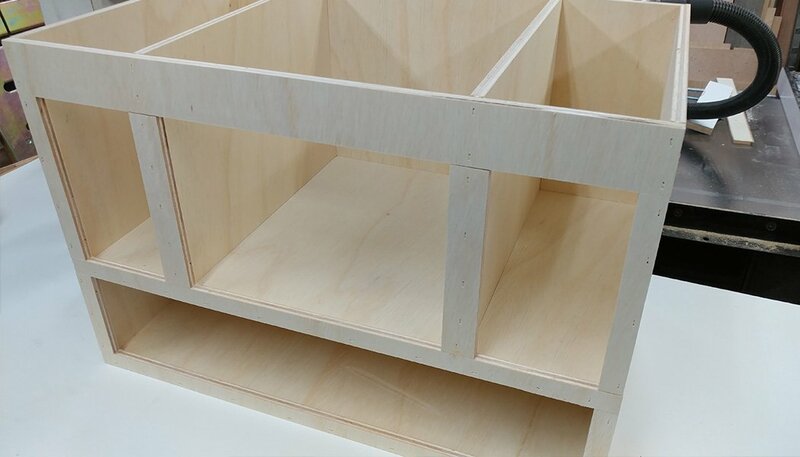 You could probably use some sort of hardwood but you really want to be particular with how you cut it since any discrepancies can cause your table to be out of alignment. 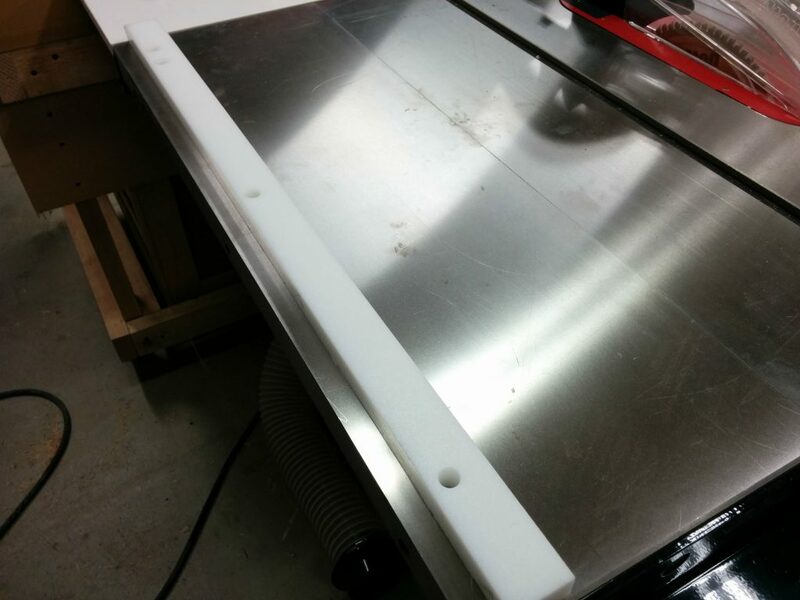 This is the first of three table saw enhancements that I implemented this time. Check out the next two below. Did this help you? 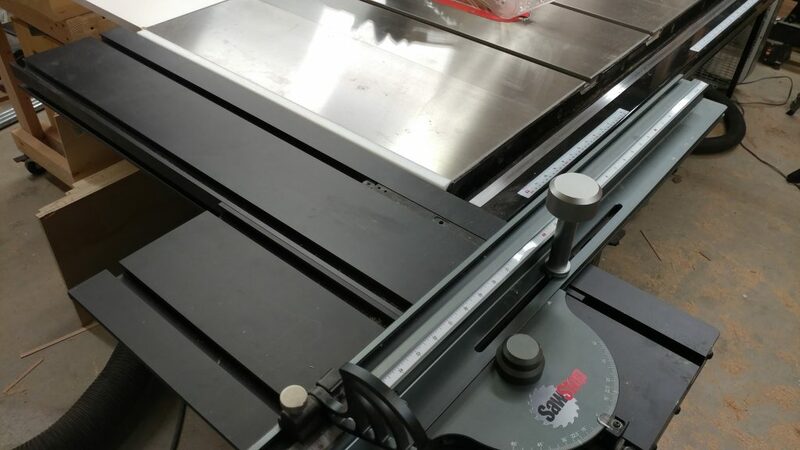 Do you have any suggestions or a completely different way of attaching a sliding crosscut table to your saw? If so, please leave a comment.